I do err on occasion. (And sometimes I arr. But only on Talk Like a Pirate Day.) For example, a couple of weeks ago I Twittered that Star Wars is one of the few things not to have gotten the zombie treatment. 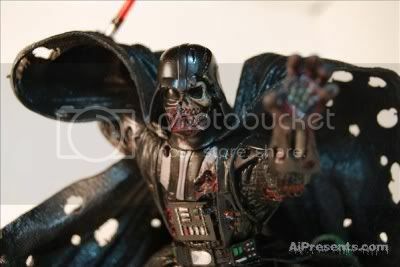 Thankfully, Bonnie Burton of The Official Star Wars Blog was handy to set me straight with this striking custom-made zombie Darth Vader from sculptor Michael Barrera. Sure, that’s creepy, but ol’ Darth was barely human to begin with. On the other hand, if you turn Yoda into a zombie… that’s a one-way ticket to my nightmares. He could have the spot right between the one where I show up to work naked and the one where those IQ-assassins from The Hills start procreating. @Alex For $1,000, I’ll make one for you myself.